Home » About » Blog » What is a Salivary Gland Tumor and How is it Treated? These are tumors that arise from the salivary tissue in the head and neck (see diagram to right). Parotid gland – the largest, sits on the side of the face, near where the jaw bone connects to the skull. Submandibular gland – the submandibular gland, sometimes called submaxillary gland (submax gland), is located under the jawbone in the front. Sublingual gland – the sublingual gland is located under the tongue. These three glands make up the major salivary glands, which are connected by a duct or ducts that empty into the mouth. Their purpose is to make saliva, a complex fluid that helps protect the teeth, digest food, moisten the mouth and food, and fight bacteria. In addition, we have hundreds of minor salivary glands which are small pockets of cells throughout the mouth, nose, and throat. Any one of these glands can give rise to tumors. The good news is that salivary gland tumors are uncommon and most are benign. However, cancerous (or malignant) tumors can be found on the salivary glands. Generally speaking, tumors of a small gland (such as the submandibular or minor salivary gland) are more likely to be malignant than a tumor of the parotid gland. Lumps that develop in these glands require appropriate evaluation and work-up by someone with expertise in these diseases. There are dozens of benign and malignant pathologies and it is important that anyone who treats these tumors be familiar with the risks, causes, types, and natural course of these tumors. Occasionally, salivary masses may be metastatic tumor from another site in the body. Work-up of these masses usually includes diagnostic imaging (CT scan or MRI), and a biopsy called fine needle aspiration (FNA), where a small sample of the mass is taken with a tiny needle for evaluation by a pathologist. Treatment for salivary gland tumors is dependent by the tumor’s size, location and the possibility of malignancy. I usually recommend that these masses be removed surgically. 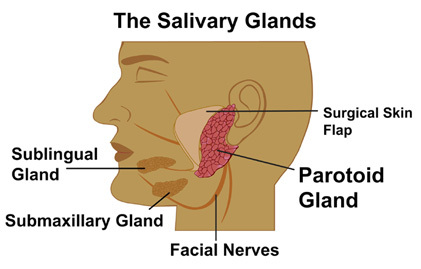 Because of the proximity of salivary glands to important nerves, for example the facial nerve (moves the face) to the parotid gland, and the hypoglossal (moves the tongue) nerve to the submandibular gland, surgery should be performed by an experienced surgeon, like the team at Fox Chase. Learn more about head and neck cancer treatment options at Fox Chase Cancer Center.